And look what’s being done to our water! It was April 2012, Hamilton city council was discussing water fluoridation and we decided to present city council with a petition calling to end the practice. A whole host of people including toxicologists, ecologists, activists, and many more came up one after another. To present why they felt fluoridation needed to end in the city. The petition has over 1200 signatures, enough to require the city to take action under provincial law. Unfortunately the term action is not clearly defined. The council decided to ask Health Canada for any safety information regarding the chemical being used to fluoridate (hydrofluorosilicic acid). It is now only months away from being three years later and Health Canada has not even responded to the request, never mind answer it. 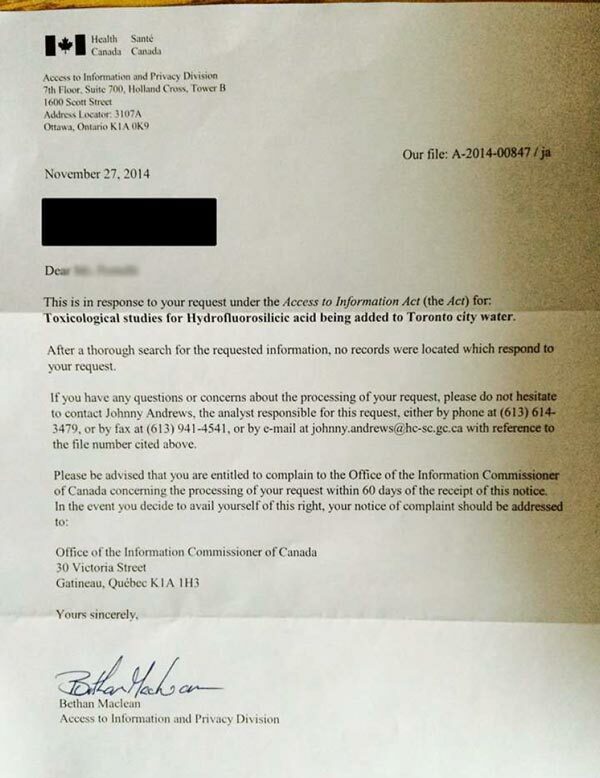 Thankfully a person in Toronto filed a FOIA request asking for any toxicological studies on hydrofluorosilicic acid. Below is a picture of the response that was received. 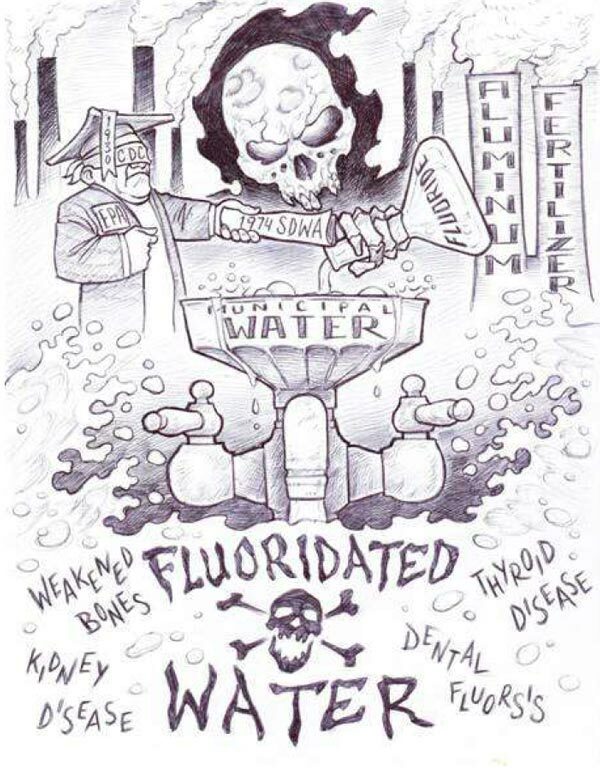 Can you believe that artificial water fluoridation is merely “about the cavities”? Of course not! At a public meeting in Waterloo, ON in October, 2010, Health Canada’s Chief Dental Officer, Dr. Peter Cooney, had to concede that Canada’s fluoridation practice results in less than half a cavity savings per person over a lifetime. Listen to the audio clip on this page: ODA’s Fluoridation Night in Waterloo, Ontario — where Health Canada concedes fluoridation results in less than one cavity reduction. Our elected officials are still buying into this load of nonsense despite the mounting scientific evidence. Here’s a letter Cor sent to Mayor Spearman along with Fluoridation’s 70th Anniversary – Not Something to Celebrate. Now that you have been mayor for a couple of years and Are the Government, I would like you to give serious thought to the fluoride issue. None of the citizens should be forced to drink our poisoned water. Governments of all stripes appear to be in cahoots with the Monsanto’s, the Bayer’s and other poison snake oil salesmen. Including those forcing fluoride on us. Please become educated on this issue. Not by listening only to the fluoride salesman!! Cor has not heard from the Mayor. Have others written to City Council and sent in the Fluoridation’s 70th Anniversary – Not Something to Celebrate? On January 26th 2015 councillors in Galway passed a motion calling for members to register their opposition to fluoridation “based on documented research that shows a decrease dental caries in all western countries irrespective of whether the water is fluoridated or not, as well as research which shows the effect of fluoride to be topical not systemic (ie works at the location not through the body)”. The motion also called on the Government to organise a national referendum on water fluoridation in the next 18 months, which will “educate the public thoroughly on both sides of the debate and allow their voice to be heard”. Galway is the sixth most populous city in the country with over 75,000 residents. The vote comes only several months after Cork and Dublin, the two largest cities in the country passed similar motions. 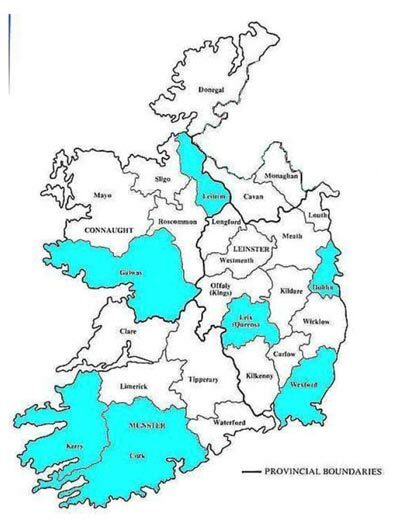 A similar vote by the Cavan County Council (which represents 72,000 residents), comes only two weeks after both the Leitrim and the Wexford County Councils—representing approximately 180,000 residents–passed motions calling for a ban of fluoridation.